Leg muscles tensed, then propelled middle blocker Sara Oxford up allowing her to execute another perfect kill on her teams behalf. 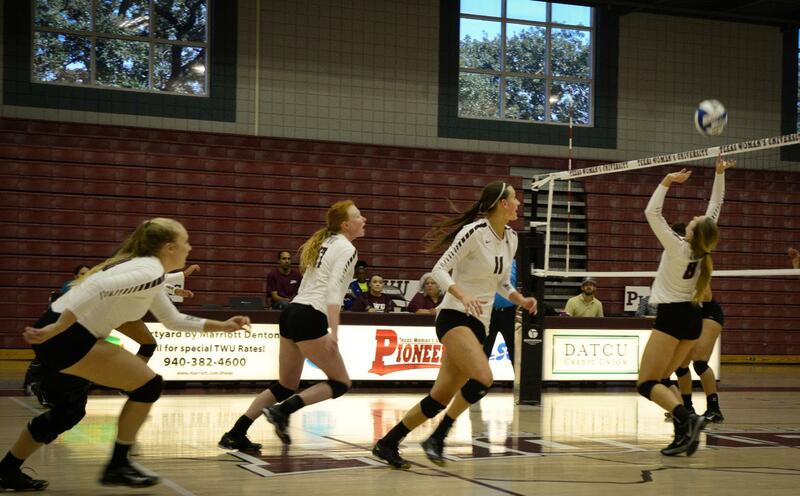 Oxford, a senior Graphic Design major, began playing volleyball for TWU in 2015. Originally from Decatur, Oxford played volleyball in high school before attending Abilene Christian University and playing volleyball for two seasons. She then made her way to TWU, where her first year she received both the Defensive Player of the Year award and the Newcomer of the Year award. Although Oxford’s last season of volleyball started off on uneasy footing the Pioneers picked up the pace, allowing Oxford to achieve multiple game highs of 14 kills. Overall Oxford has high hopes for her last season at TWU and hopes that her and her team will continue to work successfully together. This May, when Oxford plans to walk the stage at graduation, she will be looking forward to her future in graphic design. Ideally Oxford said she would like to work as a graphic designer for a sports team and her mother was the person that encouraged her to pursue graphic design as a future career because of Oxford’s attention to detail.